Before I became a teacher, I worked as a designer, mostly in publishing, after completing a four-year degree in typography and graphic communication – yes, there is such a thing and no, it’s not learning how to type. 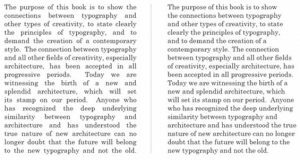 Since being a teacher, I have had many of my designer behaviours bashed out of me – there simply isn’t enough time to quibble over ligature choice and kerning – but there are some guiding principles that I do pretty much without thinking that help enhance the readability of any text I set in class and I’ve shared them below. Quick note: legibility refers to how easy it is to distinguish one letter from another in a given typeface, whereas, in design terms, readability is the measure of how easy it is to read blocks of copy of text. I’m focussing on readability here, not legibility. Pay attention to line length – don’t let it get too long. 50–60 characters, including spaces, is generally considered optimal, but going up to about 75 should be ok. If line lengths get too long, it can be hard to focus on where the line begins and ends, and, if reading a large block of text, it can take more effort to find the beginning of the next line. I actually need to adjust the line length of these blog posts because, when not reading them on a smartphone, they look a little long. Anyway, I’ll be honest, it’s not like I sit there counting characters (anymore! ), but I’m aware when line length starts to look too long and I’ll alter margins or decrease the width of text boxes. This is less likely, but don’t make line length too short either as that disrupts the flow of reading in a long block of text. 45 characters is generally considered the lower limit. Avoid using too many fonts in one design or on one page – readjusting takes effort. I use a maximum of two – one for the body text and one for headings if I feel it’s needed. Increasing the line spacing, even just slightly, can make long blocks of text easier to read. It becomes easier to scan or follow the lines with a bit more space between them. Contrast between the text and the background colours can be very helpful, but be aware that using black text on bright white paper can create a ‘dazzling’ effect. Off-white is often a bit kinder on the eyes. A light grey or off-white background can help on screen too as less light is reflected behind the words. I’m straying slightly into the realms of legibility here, but typically, when it comes to body text (large blocks of text), serif typefaces are considered by some to work better on paper and sans serif on screen. Serif typefaces have the small finishing strokes at the end of a character. Studies in the past have shown that readers tend to prefer serif typefaces when reading text on paper, however the familiarity of such typefaces could have played a large part in this at that time – sans serifs just weren’t as common back then. There are lots of exceptions to this rule too and I find it quite a generalisation, but it’s something to consider. Certainly, sans serif typefaces work better at smaller sizes. The trouble with legibility tests is that perceived legibility gets in the way of measuring true performance. 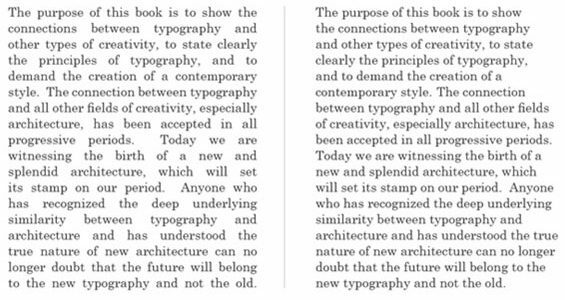 All of these points are guidelines rather than rules – typography doesn’t fit to a formula. What I would say though is that well set out text should require no real effort to read – content aside, of course. If you’re reading text and something ‘jars’ and feels like it’s an effort, that’s when you might want to tweak something. 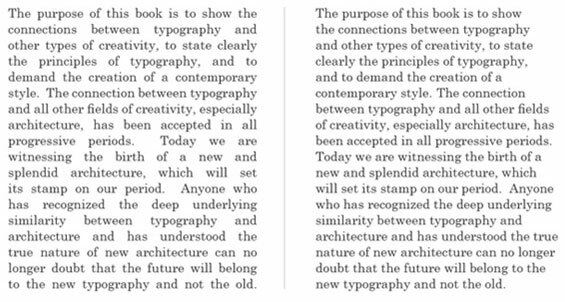 Great body text typography is great because the reader doesn’t even notice it when they’re reading. Thanks for sharing those guidelines Carol – haven’t looked at those before.